If you're looking for a puppy food to help your little one grow strong and eat healthy, ACANA's Heritage Puppy & Junior Formula dry dog food is the right choice. A food that is made with fresh free-run turkey, chicken, wild-caught fish & nest-laid eggs, these proteins are lean and excellent protein sources for a growing puppy to maintain optimum weight and peak conditioning. A diet rich and varied in fresh meats (60%) and smaller amounts of fruits, vegetables & grasses (40%), ACANA Heritage Puppy & Junior dog food mirrors a biologically appropriate diet Mother Nature would provide your puppy. 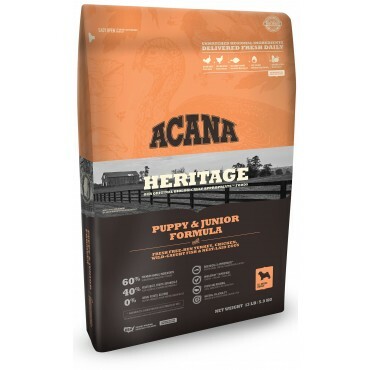 The inclusion of nourishing proteins and fats, organs & cartilage while excluding rice, potato and tapioca, ACANA Heritage Puppy & Junior delivers natural palatability and nutrients naturally without synthetic additives. ACANA Puppy & Junior features an unmatched variety of local ingredients that are raised by people ACANA knows and trusts, sourced from federally inspected facilities and delivered to ACANA's DogStar® Kitchens fresh or raw!